A pope was chosen last week in Rome. I also have a pope of choice, and he isn’t of the Roman Church bent. Since many were oohing and aahing about the new head of the Roman Church, I decided to put forth my nomination for pope, and he’s an American architect whose work I find absolutely stunning: John Russell POPE! He is one of the persons responsible for making our nation’s capital the gorgeous, gleaming, classically-themed envy of the world. To understand Pope’s architecture is to understand the history of our country, and it’s a fascinating story of how political ideals influence aesthetic consideration. From the very beginning of the building of Washington, DC, it was in the minds of the Founding Fathers that America was the first true democracy since ancient Greece. With this is mind, and the Roman Republican period (ca. 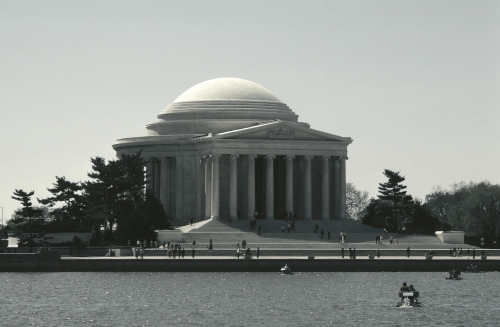 509–27 bce), the founders’ desired architecture for Washington’s public buildings that reflected this belief. The aesthetic was revived in 1901 with the McMillan Plan, devised by the Senate Parks Commission to restore the plan by the original 1700s designer of the capital city, Pierre L’Enfant (1754–1825, born France). L’Enfant, influenced by the Neoclassicism rage in Europe, envisioned streets lined with temple-like buildings that harkened back to ancient Greece and Rome. Pope studied architecture at Columbia University, and subsequently in Greece, Italy, and Paris. In Paris he studied at the École des Beaux-Arts, a bastion of classical revival styles, as well as revivals of Renaissance and Baroque architecture (both more or less dependent on ancient Greek and Roman architecture). 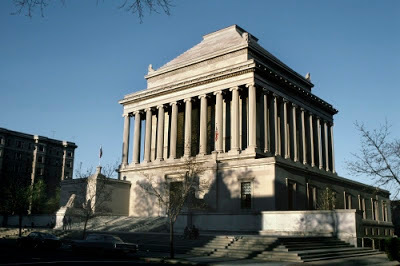 The Temple of Scottish Rite in Washington is a perfect merging of Greek Revival and Roman Revival styles. Pope firmly believed that public architecture should bear the gravity and dignity of classical ancient architecture. The design of the Scottish Rite Temple is a merging of the two, while owing its overall form to the Hellenistic period (ca. 320–100s bce) in the form of the Mausoleum in Halicanarssus, Asia Minor (now Bodrum, Turkey). In 1917, Pope joined the Commission of Fine Arts (which grew out of the McMillan Plan to oversee building in Washington, DC) and helped to guide the building of Washington in what was considered to be L’Enfant’s original intent. After 1922, he focused more on designing architecture. Perhaps his most famous work of that period, among many, is the Jefferson Memorial. Studio activity: A collaborative architectural model in a Neoclassical style. In groups of three or four, design with pencil on paper a building that represents some sort of contemporary public entity, e.g. a church, government building, school, or monument. Look at buildings from ancient Greece and Rome, and use elements of those styles to build a model: the column, pediment, arches, domes, etc. Use small boxes, heavy paper, paper tubes and found three-dimensional forms to construct the building. Use a Styrofoam or cardboard base, and tape, glue or staples to connect the parts. Finish by using paint or markers. Correlations to Davis programs: Explorations in Art Grade 1: 2.12; Explorations in Art Grade 2: 6.31, 6.32; Explorations in Art Grade 4: 3.15, 3.16, 3.18; Explorations in Art Grade 5 2.12; Explorations in Art Grade 6: 4.19, 4.20; Exploring Visual Design: 1, 7, 8.